Palace of Versailles: 8:15am. You must visit the attraction on the date selected by you for the booking. Palace of Versailles: Bus departs from PARISCityVISION Agency, 2 rue des Pyramides, 75001 Paris. Palace of Versailles: Same as the start point. 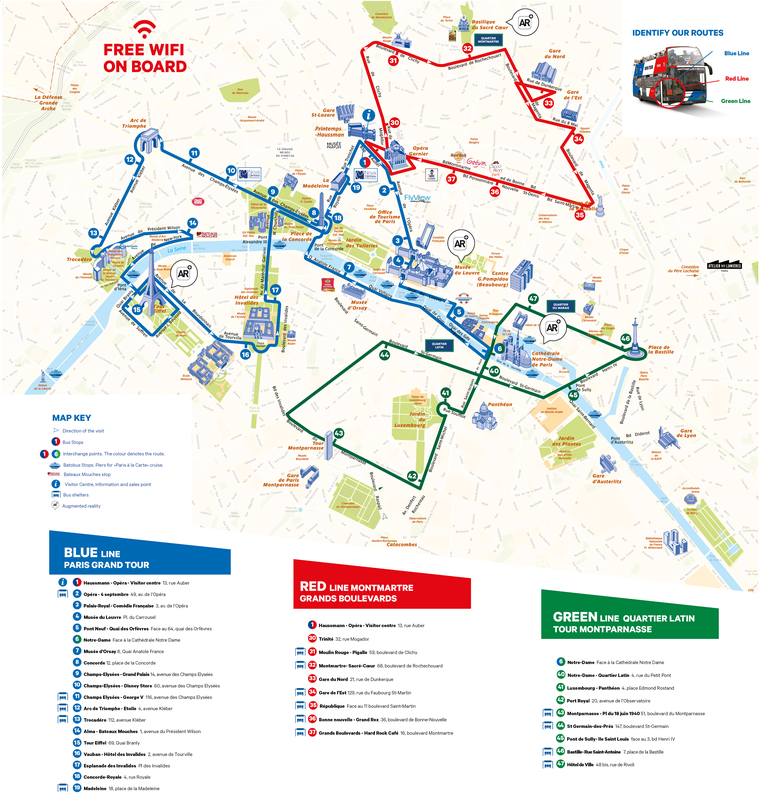 Explore the charming city of Paris with this 1-day hop-on, hop-off pass, covering more than 30 stops across 3 different routes. Explore the captivating French capital from the upper deck of a double-decker bus. Enjoy Paris sightseeing the convenient way, simply hop off at any of the stops you like to visit the attraction of your choice. Hop back onto the bus to head to your next destination. Enjoy the many wonderful sights of Paris as you cruise through the city on a vibrant yellow bus. Choose from a number of interconnecting routes and listen to informative audio-commentary to find out more about the Paris attractions you pass along the way. Your hop-on, hop-off pass also includes two FREE walking tours covering the Notre Dame Cathedral and major highlights of Paris. The Highlights of Paris: See the major Paris attractions including the Champs Elysées, the Louvre Museum, Arc de Triomphe, and the Eiffel tower in the introductory walking tour of the city. The tour operates daily at 1:30pm. Meet your guide (look for pink vest!) outside Opera Garnier, on the steps facinga venue de l’opéra. Your pass also includes an audio-guided tour of the Palace of Versailles with a round-trip transfer from Paris in a luxury air-conditioned coach. The tour departs from the local operator’s office at 2 rue des Pyramides. You can either opt for a morning or an afternoon departure from Paris to Versailles. Explore this stunning UNESCO World Heritage Site with your driver-guide and revel in the rich history and the site’s extravagance. The residence of the Kings of France Louis XIV, Louis XV and Louis XVI from 1682 to the French Revolution, the Palace of Versailles boasts Baroque architecture, one-of-a-kind art and furniture pieces, all of which showcase the greatest craftsmanship of the age. Your audio-guide will enlighten you about the history of the palace and guide you through the site. Enjoy a tour of the spectacular Hall of Mirrors and the Royal Apartments. Spread across more than 721,000 square feet, the Palace of Versailles boasts over 700 rooms. Visit the King's Grand Apartment, the Queen's Grand Apartment, the Coronation Room and the Queen's Bedroom, once occupied by Queen Marie Antoinette. You can stroll through the magnificent Gardens of versailles after the tour. Admire the 386 works of art, the fountains, flower beds, ponds and trees. You will return to Paris by coach in the evening. For Palace of Versailles tour, please arrive at the start point 30 minutes early with a printed copy of the voucher. The tour departs from the local operator’s office at 2 rue des Pyramides, Paris 75001. The date and schedule you select at the time of booking, represents the date you will enjoy the Palace of Versailles audio-guide tour. At the boarding time at the meeting point, you will be given your hop-on, hop-off pass. The duration for the Versailles tour will be 3.5 to 4 hours. The return time for the bus would be given by the bus staff once the customers board the bus.